Twenty-nine years ago tomorrow Wayne Gretzky, then playing for the Los Angeles Kings, set a National Hockey League (NHL) record by scoring his 100th point of the season for the 11th season in a row. It was an extraordinary achievement – but just one of a long sequence of landmarks in the career of a man who has been widely adjudged as the greatest ice hockey player of all time. “The Great One”, as he soon came to be known after his prodigious early impact on the game for the Edmonton Oilers, was only a year away from retirement when he made his debut at the Winter Olympics after the NHL had agreed for the first time to release its professional players to take part in the 1998 Nagano Games. The invitation had lain open at the three previous Winter Olympics following the International Olympic Committee’s vote in 1986 to allow professional athletes to compete in the Games, but the NHL had been reluctant to allow players to take the required two-week break midway through their club season. Gretzky’s long-anticipated Olympic debut took place at the Big Hat arena and I was privileged to be among a crowd of 9,960 to watch him play his habitual, scheming role in a 5-0 win against Belarus in Canada’s opening match in Group D.
Before the Games got underway, Canada’’s coach Marc Crawford had, somewhat originally, described his then 37-year-old star as “one of the highest-statured athletes of these Games”. Ironically, Gretzky, at 5ft 11in and rarely over 12 stone, was one of lowest-statured athletes of those Games. Reportedly he did worst in strength tests while with the Oilers, managing to bench press just 140 pounds. Controversially, Crawford had passed over Gretzky for the captaincy of his national team in Japan, offering that honour to his younger and considerably more robust team-mate Eric Lindros. To be sure, the burly Lindros – 6ft 4in and 17 stone-plus – made a big impact on the game, finding the time to score twice in-between bending the boards with the nearest Belarussian. 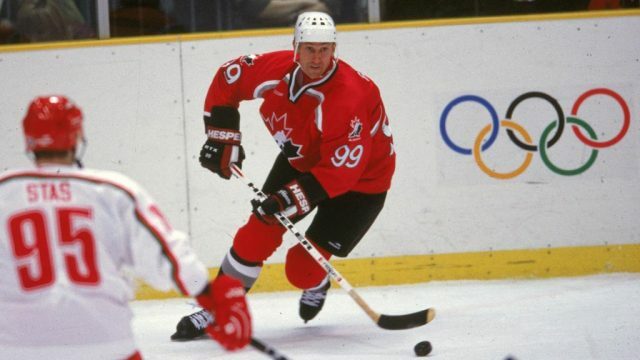 But the man in the trademark number 99 shirt showed enough finesse and composure to indicate why he was still a profound influence on the Canadian cause. He could not score on his debut, although he came close with a characteristically snake-like snap-shot in the third period. Gretzky’s face was all angles – a long chin, quirky eyebrows and a nose that could have been Pinocchio’s. His game was the exact reverse of his captain’s – rather than being about contact, it was about space. Experienced observers of the game reckoned the serious back injury he had sustained five years earlier had taken an edge off his effectiveness. But the only sign of it he offered on this occasion was during changes of personnel. While his younger team-mates vaulted to and fro over the barriers, Gretzky, sedately, used the gate. Gretzky himself was enthusiastic about the Olympic experience, commenting after his opening game that he was happy sharing his room with team-mate Rod Brind’Amour. “Before we came people said we weren’t going to like the Village because it was too small,” he said. “But it has been the exact opposite. It is great to be in this environment. Asked about Canada’s Olympic prospects of winning a first gold medal since they had compiled their sixth consecutive victory in 1952, the Great One became the Cautious One, pointing out that the European-style rinks on which they were playing in Nagano – which were significantly larger than those on which NHL matches were played – could prove to be a significant factor. In the end the adjustment proved to be marginally too great. Canada finished top of their group after beating Sweden 3-2 and the United States 4-1, then earned a 4-1 quarter-final win over Kazakhstan before going out in the semi-final at the hands of the eventual gold medallists, the Czech Republic, losing in a shoot-out after the match finished at 1-1. A 3-2 defeat by Finland in the bronze-medal match proved to be Gretzky’s final international appearance, as he announced his retirement the following year. But the Great One was not to be denied more successful experiences at the Winter Olympics. Four years later at the Salt Lake City 2002 Games he was executive director of the Canadian team. His normally calm demeanour went AWOL after his team had scraped through their group in third place, finishing with a 3-3 draw against the defending champions. The US, meanwhile, were clear winners of their group and their fans were clearly very appreciative of the contrast in fortunes. Under his direction, Canada moved with increasing momentum to a final where they earned their first Olympic gold in 50 years with a 5-2 win over – the United States.